Dave Laudat believes that the human spirit is stronger than any concrete structure; that threats don't count unless we see them as threats; that hurricanes and other natural disasters are not disasters in themselves; that if everyone in Dominica is not riding the resilience train it will not get very far from the station. Points well taken, Laudat's audience, by its reaction, seems to be saying. 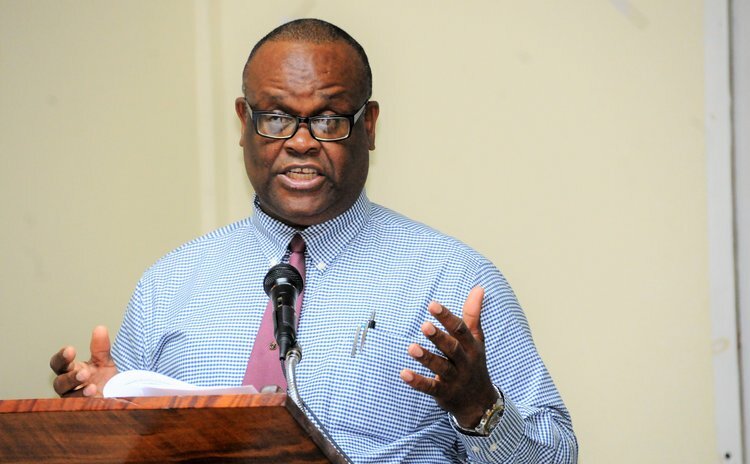 Laudat, a public health and social services professional, was the feature speaker at last week's annual general meeting of the Builders &Contractors Association of Dominica (BCAD). He told about 50 members of BCAD who attended the non-business section of the AGM that one of Hurricane Maria's major lessons is that life consists of much more than houses and bridges. "After all, things (structures) were gone. In many instances all gone," Laudat said. "The morning of Tuesday, September 19th, 2017 finally came and yes, we were forced to turn to our inner spirits; for the outward things were gone. "Some of us crumbled and wondered if it was over. However, the overwhelming majority of us suddenly felt a rush of energy to pick up the pieces and refused to stay down but rather ride on the tide. Something inside of us told us that it will all come together again." Laudat said in the context of capacity building for resilience, it makes sense to take a new look at the term "natural disaster". "Hurricane Maria of its own was not a disaster. Storms, earthquakes, volcanoes, floods are not disasters," Laudat said. "They are simply naturally occurring phenomenon. Disasters occur when natural phenomenon meet with human susceptibility". He argued that Hurricane Maria caused massive destruction because Dominicans owned houses with roofs that were poorly constructed, houses built in water paths, bridges that were structurally poor. "When that naturally occurring phenomenon like a hurricane meets with human susceptibility, a disaster is created," he said. Additionally, Laudat reasoned, if a country is to recover quickly from a disaster, Dominicans positive perception of their national and local institutions is essential. "It was found that that perceived threats, optimism, and public attitudes such as patriotism and trust in governmental institutions, are the most frequent components of their understanding of national resilience," Laudat said. And what about Dominica's annual treat of being hit by a natural disaster? Using the example of Israel and America, countries that are under constant threats of terrorism, Laudat argued that the people of these countries have adopted an attitude that "threat or no threat life continues". "So too, in the face of natural disasters we can either withdraw or chose to build a steely resolve that nothing will stop our normal activities," Laudat said. But to continue to rebuild their country after natural disasters Dominicans must be optimistic about their future, Laudat said. "That Dominica survived David and many other storms and so we will again. It takes an optimistic individual to believe that despite what they saw on the morning of Tuesday September, 19th, 2017 that there is hope and confidence about the future. "National resilience is achieved on a shared collective responsibility. If there is exclusion of any type, then national resilience will remain a "cliché" with no tangible expression. "Our revised building policies and practices will definitely better prepare us structurally for moments of disaster. However, builders and contractors, when all of our building techniques would prove insufficient and those structures crumble around us and the breath of life remains, when what is left is the human spirit.
" I recommend to you that a proper understanding of the threat, our optimism, our patriotism and trust in our governmental institutions are some of the political and psychological factors that will spur new hope and vision in us for overcoming the obstacles".